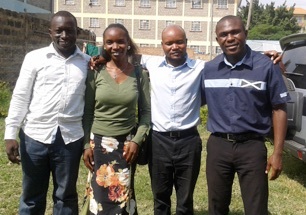 In August, four people were brought into church membership: Joshua, Lynda, Amos and Magomere. Joshua and Magomere went through water baptism the same day, since they were led to faith in Christ through GBC’s ministry. Amos and Lynda have joined us as already-baptized Christians. The four have added a formidable force to the church youth ministry. Brother Bill Issa, our missionary in Kampala, Uganda, is laboring there and it was time to visit and fellowship with his family and the church. About 20 people consider Reconciliation Baptist Church their place of worship and a number that I talked to are thankful to God for this biblical ministry that has opened their eyes to great truths in the Scriptures. To mention but a few, Asumani, Allen, Emma, Sabrina, Ssuna, Alex, Jovan, Joseph, and Francis are all lovely people to be around. On Saturday, Bill and I visited two families (church members) where we encouraged them with the Word and prayed together. Asumani and his wife just lost their first pregnancy and it was a time to encourage them with the sovereignty of God in our lives. William Cowper’s song ‘God moves in a mysterious way His wonders to perform’ came in handy in encouraging the couple. Come Sunday, Pastor Bill led a Bible study and I had the honor of preaching. These were great days spent in fellowship with the brethren.